Press Release from City of Fort Worth, Texas. 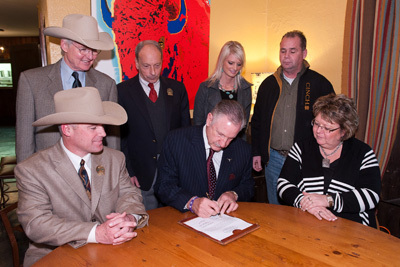 Representatives from the Reichert Celebration signed a letter of intent Friday, January 18 to bring their world-renowned horse show to Will Rogers Memorial Center for five years. This year’s show is set to roll into the center Sept. 2-11. Heralded in equestrian circles as the top all-breed horse show and futurity, the Reichert Celebration began in Iowa in 1999 before moving to St. Louis and, most recently, Tulsa, Okla., as the show expanded. In 2010, Reichert drew more than 12,000 entries from all 50 states, Canada and Europe. By coming to Fort Worth, organizers J.R. Reichert and Terry Schroeder were able to accommodate calendar changes for organizations that participate in the show, shifting the event from August to September. With Fort Worth’s historic, cultural and entertainment offerings, they hope to attract even more entries. Public Events Department Director Kirk Slaughter said Reichert’s move to Fort Worth highlights how the City’s commitment to first-class equestrian facilities maintains Will Rogers’ reputation in the industry. The City’s investment in amenities includes a new Equestrian Center, set to open in early 2012. The new facility will boost the number of horse stalls to more than 2,700 and add two indoor exercise areas, freeing up indoor exhibit space currently used to expand capacity. For City leaders, the return on investment is already starting to show. With Tulsa seeing nearly $20 million in economic impact from the 2010 Reichert Celebration, Moncrief said Fort Worth businesses will be champing at the bit this September.